Dinner was very simple to put together. 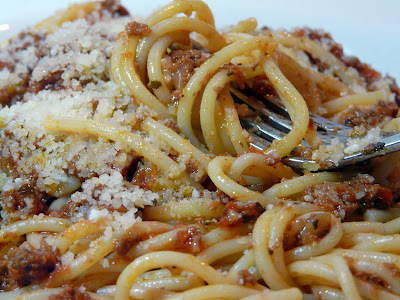 Spaghetti with Bolognese Sauce. And the sauce was already made. Just had to take it out of the freezer. Optional: If you have a rind from a Parmesan cheese add it to the pot to simmer along with the sauce. Really enriches the sauce. Saute chopped onions and celery in olive oil until softened. Add minced garlic and cook for 1 minute. Add the meat and saute until no longer pink. (Add cream/milk if using it and simmer until it has evaporated) Add 1/2 cup white wine and simmer until wine has evaporated. Add the dried herbs and fresh parsley. Coarsely puree tomatoes and add to the pot. Add chicken broth and simmer for at least 2 hours on low heat. Serve over spaghetti with fresh grated Parmesan cheese. NOTE: You can also add the cream at the end rather than at the beginning. Makes for a richer sauce. The purpose of adding it early is that it is suppose to tenderize the meat. I baked a pound cake for dessert and drizzled it with a white chocolate ganache. The cake was actually the one that belongs with the Cassata cake that Lori from All That Splatters made last week. Rather than add lemon or an orange liqueur, I just scraped the seeds from a vanilla bean and added them to the batter. We were both in a pasta frame of mind~ I love having sauce in the freezer..Look how well one can eat last minute! 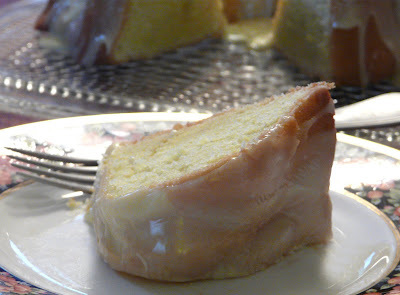 The pound cake looks perfect too.I am going to make one soon..I want to try petits fours again.. I must try that pound cake!